You don't need a workout partner to push yourself past failure. Here are three intensity-blasting techniques you can use when training alone. I'm single by choice. No, we're not talking about my marital status. I'm referring to the fact that I don't have a workout partner. Sure, I was hitched in the past, but finding someone who shares my training goals, my degree of commitment, and the hours I prefer to train isn't easy. Add to that the fact that my workout partner would need to match my level of ability; after all, who wants to pull off a dozen wheels on the leg press between every set, just to put them back on again? So the only rings I've got are the collars I put on the end of the barbell—and I do that myself. When training to maximize muscle size, choose a weight that lets you reach muscle failure between 8-12 reps while still using good form. If you choose a weight that's too light and stop at 12—but you could've done five more, for example—that doesn't count; you need to do a true set of 12. The onset of muscle failure within that range initiates the tissue breakdown that allows the fibers to maximally rebuild bigger and stronger. The downside of working out alone is that I find it harder to push myself. It's nearly impossible to get those extra reps when there's no one behind me barking words of encouragement. Little wonder many of my sets end up a little short of muscle failure. Why is that bad? Because training to muscle failure is an important aspect of building muscle. That's why, even though a muscle that feels like it's on fire is uncomfortable, successful bodybuilders learn to embrace that pain. After all, beyond the burn is where real gains lie. Hence the bodybuilding mantra: "No pain, no gain". Moreover, evidence points toward selectively training past the point at which you can't do any more on your own. While science shows that taking every set past failure is counterproductive, taking 1-2 sets of each movement past failure can lead to serious gains. Doing so enables you to more thoroughly damage the muscle fibers. This means that, given rest and good nutritional practices, muscles have a better chance to repair themselves and grow larger. You might think you need a training partner to go beyond failure, but actually, you don't! There are a number of training strategies to push past failure on your own. Try these three on for size. This technique takes advantage of the muscle fibers' ability to quickly replenish the energy substrates that power muscle contractions. So instead of doing a heavy set of 7-8 reps and racking the weight because you can't do any more, with rest-pause you take that same weight and break it into segments interrupted by several 20-second breaks. These breaks allow those intra-muscular energy systems to quickly restock. Here you might do just 3-4 reps, take a 20-second rest, and do another 3-4 reps, alternating work/rest segments until you've completed a total of 4-5 work segments. At the end of the full set, you've done 12-20 total reps—a much greater amount of work than had you done just the 7-8 reps without the breaks. The boost in intensity causes additional muscle fiber breakdown and helps spur muscle-building hormones that promote hypertrophy. "Instead of doing a heavy set of 7-8 reps and racking the weight, with rest-pause you take that same weight and break it into segments interrupted by several 20-second breaks." In Your Workout: Do this intensity booster early in a session, before your strength levels wane. Typically, you should choose a weight that you can do for 7-8 reps (but actually doing only 3-4). Alternatively, you could choose a lighter or heavier weight and adjust the rep targets. So you might use a weight than you can do for 12 reps (your 12RM weight) but string together segments of 6-7 reps, punctuated with 20-second rest intervals. Best Exercise Choices: Your best exercise choices are multijoint moves that don't require a great deal of effort to get into and out of, and with which the weight can be easily racked and unracked. Hence, machine chest or shoulder presses are better than dumbbell presses for those body parts. The Smith machine in particular can work really well here. "By restricting the movement to just the top half of the ROM, you're above the sticking point and are capable of completing a few more reps with a given weight." Typically, you take a rep through its entire range of motion, from the muscle's fully stretched position to its fully contracted one. Ultimately, a set ends when you hit what's called the sticking point; the biomechanics are such that you're in the weakest position leverage-wise as fatigue sets in. For most of us, that's somewhere near the middle of the movement arc. With partials, you're focusing on only a portion of that range of motion (ROM). For example, once you reach muscle failure, by restricting the movement to just the top half of the ROM, you're above the sticking point and are capable of completing a few more reps with a given weight. This means you're able to subject the fibers to a higher degree of intensity than what they're normally accustomed to. Let's say lying leg curls with 120 pounds yields eight reps, and you can't do any more on your own. Don't give up! From the fully contracted position, lower the weight halfway down and contract the muscle again. Continue doing as many reps as you can over this partial ROM. In Your Workout: Do this on the last set or two of a given exercise. Because it fatigues a muscle more than if you had ended the set when you reached full ROM failure, it affects your strength on successive sets and exercises. Best Exercise Choices: Choose movements in which you can safely train past muscle failure over a shortened ROM. For the most part, that's machine movements. Not counting warm-ups, it's likely that you take just about every set close to muscle failure. 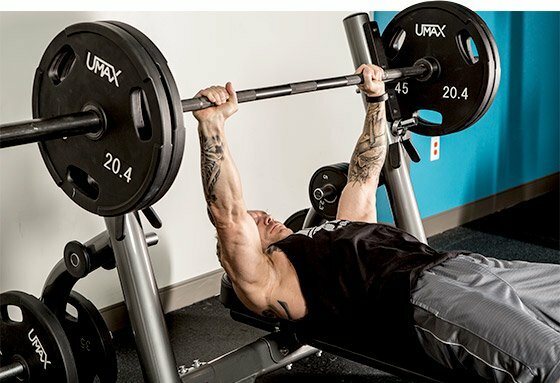 Now, instead of racking the weight or putting the bar down, immediately reduce the poundage by 20-30 percent of the total weight and continue on with your set until you reach a second point of muscle failure. You can even repeat this a third time. Besides burning more calories, this technique recruits additional motor units to engage the maximal number of muscle fibers during a set. At the end of your workout, dropsets can also help you engorge the muscle with additional fluids that help stretch the fascia around the muscle and promote the release of muscle-building hormones. Dropsets are also known as strip sets. Pin-loaded machines and cables are your best choice for dropsets as they allow for rapid weight changes. In Your Workout: This technique should be used on your last 1-2 sets of a given exercise or during the later stages of your workout. The increased degree of fatigue can adversely affect your strength levels on your remaining sets, so it's not necessarily good to use early in your workout when training for strength. Keep your rest periods as short as possible to ensure that the lighter weight doesn't become an altogether different set. Changing plates and then getting back into position—especially when training alone—lengthens the rest interval, so having the weights you need handy makes sense. Best Exercise Choices: Pin-loaded machines (changing the weight is as easy as pulling and reinserting the pin) and cables are great dropset options. With dumbbells, have a second pair nearby. When using a barbell or plate-loaded machines, use smaller plates on the ends so making a weight change is fast. Taking the next step in muscular development is partially about training better, but it's just as much about removing the roadblocks to anabolism that hold you back. Are you committing any of these crimes?